Still Playing in the Sandbox #WurmOnline – Nomadic Gamers, eh! I’ve been playing WurmOnline for four months now, which is not that long in the eyes of the veterans, but I’ve been having an absolute blast, so much so that it’s rare that another game can hold my attention as well as Wurm does. As I’ve said many times in the past, there’s just ‘something’ about the game that appeals to every aspect that I enjoy (minus the griefers). On that front, things have been blissfully quiet, and I hope they stay that way. March break is over, and I rarely see the accused unless it’s the weekend or evenings. Fine by me. I’m still working on getting all three of my deeds fully protected. While the animals are secure, I now have a lot of extra walls that were on my perimeter, so I am working on taking them down. Unlike deed walls, perimeter walls don’t have a bonus when the mayor tries to knock them down, so it takes some time. There has been an outbreak of unicorns and trolls around my mountain side deed, the unicorns provide good meat and hides (as well as unicorn horns which I can use to make healing covers) and the trolls, well. I can’t defeat those yet. I cower inside my humble stone house, hoping they ignore me. It’s still quite neat to see them roaming around. This weekend should be a lot of fun in game. First of all there is a Fo sermon that will be taking place the week of March 24th to 31st. Fo priests from all Freedom servers are welcome to come and join in at Tristan for faith gains. I’ll be leaving both my Fo priest and my follower online at the church to help this. On the 31st there is also going to be a server wide Vynora event. Anyone who is a follower (or priest) of Vynora will gain 5 hours of sleep bonus if you’re online when this takes place, so I’ve been working hard to use mine up in time. Not that difficult to do, my Vynora priest has been busy working on HFC (hot food cooking) and making meals as well as casting opulence for skill gains. 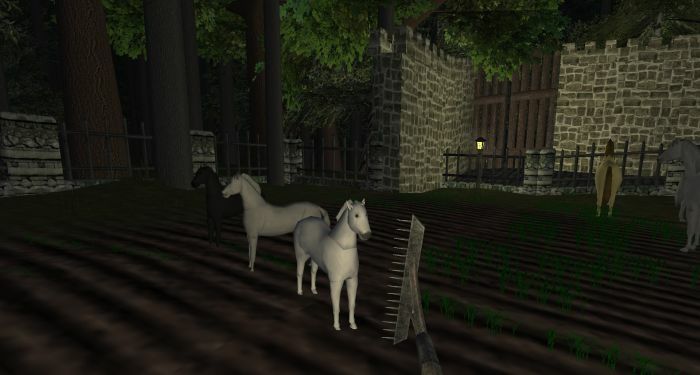 I’ve started back up with breeding cattle and horses, I currently have five foals, with a handful of full grown horses. I’ve been letting the bad trait ones free in the wild for others to kill / use. The cattle I’ve been killing for hides, I just don’t enjoy killing horses that much and would rather let them go. I have a few colours of horses now which is nice, hopefully I’ll get even better stock as I continue. Animal husbandry is a bit slow to raise, but I know I’ll get there (eventually). Once all of the deeds are finally taken care of I can go back to working my skills, such as tailoring and rope making. I’ve been working on my jeweler, Currently sitting at 18, it’s my goal to reach 20 today. My black bears have reached adolescence, and once a few more days have passed I’ll be able to breed them and try to get some nice trait bears. Although if Arkenor’s experiences have taught me anything it’s that this is not an easy task by any means.